File Expert (By GMobile Apps) is a very popular file management app for Android. It is available on Google Play Store for free; a more advanced version File Expert (By GMobile Apps) Pro is available for $2.99. File Expert (By GMobile Apps) can be used to access and manage DriveHQ cloud file storage with either the FTP or WebDAV protocol. In this document, we will talk about how to configure File Expert with DriveHQ's FTP Server Hosting service. The information is also useful in configuring other FTP client applications. You can enter the FTP server/account info as shown in the above screenshot. Make sure to use your own username and password. You can select the FTPS protocols, which is more secure than the plain FTP protocol. For other FTP parameters, please read below. 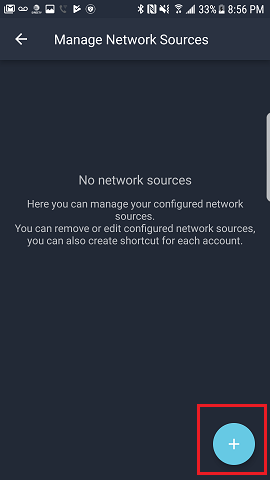 To connect to DriveHQ's FTP cloud storage, you just need to tap the new DriveHQ FTP source (connection) in the above screen. It will log on to DriveHQ's FTP server and display your cloud files/folders as shown below. . If you incorrectly configured the FTP server/account info, you can edit it in the "Manage Network Source" screen.